The San Jose Blog: What's Going on, Diridon? 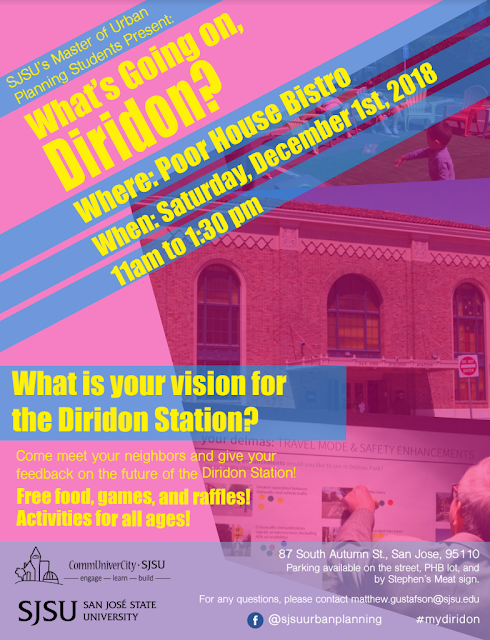 The SJSU Urban Planning Department and CommUniverCity are hosting a community event to educate San Joseans about the Diridon Integrated Station Concept. As many of you know, Diridon will become one of the busiest transit hubs in the country over the coming decade--especially when the BART and High Speed Rail connections are complete. This event will provide some insights on what is already being planning and give you the opportunity to share your two cents. There will also be free food, games, and raffles! The event takes place at the Poor House Bistro (87 South Autumn St., San Jose) on Saturday, December 1st, from 11am to 1:30pm.